The SCSI Cable Tester is designed specifically to test cable assemblies made to SCSI specifications! Detection ends ninety percent of most SCSI problem installations! Tests cable in seconds! Continuity tests alone are not sufficient to qualify SCSI cable assemblies. Proper testing of SCSI cables must include a test for correct connection of twisted pairs and shielding. Continuity tests check only that wires are making connections on both ends of a cable. Twisted pairs in the cable must be matched with the correct SCSI signal pairs - otherwise, it is possible to have a SCSI signal (signal and ground pair) placed on wires that are not in the same physical twisted pair (see diagram above). This will cause crosstalk with resultant SCSI errors. The SCSI Cable Tester will perform this test, called an Integrity Test. The continuity test and twisted pair integrity test can be performed on a SCSI cable in about 10 seconds. For testing cables with the VHDCI connector you will need an adapter. This adapter plugs into the 68-pin HD connector on the ST123 to adapt it to the VHDCI type. Depending on the testing you must do, you may need one, two or three of these adapters, Part Number AD1003. When a SCSI-configured system has a cable problem the symptoms vary greatly, from intermittent operation to SCSI "hangup," resulting in excessive system installation delays and costs. 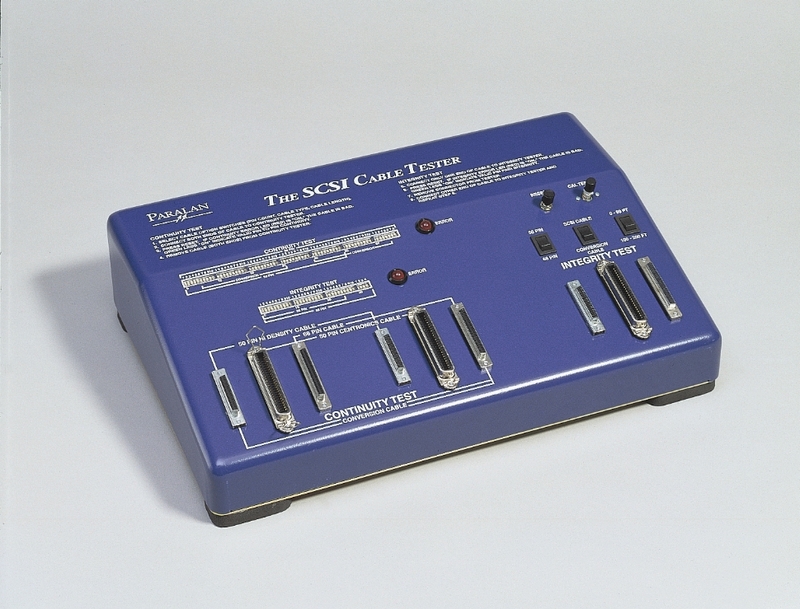 The SCSI Cable Tester is designed with emphasis on simplicity of use. New users will be able to operate the tester within five minutes. A. Tests pin to pin connection of cable. C. Checks for wire to wire shorts. D. Checks for wire to shielding shorts. Tests for twisted pairing. By measuring the capacitive reactance of a signal pair, the integrity test will determine if each signal pair in the cable has proper capacitive reactance. A green LED is associated with each pair of signal lines. If the capacitive reactance of a pair falls within the acceptable reference range, the green LED will light. Should ANY signal pair not pass the test the red Integrity Error LED will illuminate. 1. SELECT CABLE OPTION SWITCHES (PIN COUNT, CABLE TYPE, CABLE LENGTH). 2. CONNECT BOTH ENDS OF CABLE TO CONTINUITY TESTER. 3. PRESS RESET. IF CONTINUITY ERROR LED (RED) IS "ON," THE CABLE IS BAD. GREEN LEDS "ON" INDICATE VALID PIN TO PIN CONTINUITY. 4. REMOVE CABLE (BOTH ENDS) FROM CONTINUITY TESTER. 5. CONNECT ONLY ONE END OF CABLE TO INTEGRITY TESTER. 6. PRESS RESET. IF INTEGRITY ERROR LED (RED) IS "ON," THE CABLE IS BAD. GREEN LEDS "ON" INDICATE VALID PIN PAIR INTEGRITY. 7. REMOVE CONNECTOR FROM TESTER. 8. CONNECT OTHER END OF CABLE TO INTEGRITY TESTER AND REPEAT STEP 6.